Guitarist Joe "Blower" Garvey of the rock band Hinder enjoys the kind of rock-and-roll lifestyle that some might imagine went out with big hair. "I knew this was going to be a crazy ride." he laughs. "Basically, take all the stories and times it by 10, and that's what really happens!" Since the September 2005 release of Hinder's debut album, Extreme Behavior, the band has seen its star rise thanks to a strong single--the power ballad "Lips of an Angel"--and incessant touring, including an opening slot with Aerosmith. "We've been out for almost two years now," Garvey says. "We have a couple more weeks on this leg, and then we're going to Germany and Italy for some festivals. And we're very excited about our big summer tour with Papa Roach and Buckcherry." For our acoustic performances, it's all Yamaha. The party started a few years back when Hinder's self-produced EP came to the attention of several major labels simultaneously. "It threw us into a big bidding war," recalls Garvey. "We were a day away from signing with Roadrunner when both Atlantic and Universal heard the first three seconds of our song 'Get Stoned' and came to check us out in Oklahoma City. Universal fed us the most booze, so they came out on top. They shared our vision of bringing fun rock-and-roll back to the top." At their shows, Hinder encourages the fans to have as much fun as the band. "We just make it one big party," Garvey explains. "It's the best feeling to see people leave with smiles on their faces. We have fun every night, whether it's an arena or a club. We get the crowd involved, and we keep adding to the show, like having little breakdown sections. We've gotten a lot of compliments from people, saying it sounds even better than the album." Between tour dates, the band is starting work on their follow-up release. "We're very excited about the second album," Garvey says. "We've been taking time here and there to write and do some demo work, and we'll get back into the studio around December. We recorded the first album in Vancouver, in the same place where we did the demos. Actually, we'd gone up there to try to do an independent album, but we wound up only doing about six songs. But we went back a year later and got it all done in about seven weeks. Anyway, we'll be going back there for the next one, and we'll have several months this time." Garvey doesn't anticipate any drastic departures from the straight-ahead rock of Hinder's debut. "Being on the road so much, we have more stories to talk about now!" he observes. "But musically, we're definitely going to stick with what works." A big part of "what works" is Canadian rock producer Brian Howes, who cowrote much of the material on Extreme Behavior. "Brian Howes is awesome," Garvey exclaims. "We first connected with him when we wanted to do the independent album. When we started writing, the vibe between us was just awesome. We knew we had to have him for Extreme Behavior, and we're definitely having him back for the next album. He's an amazing, amazing producer, and we just seem to click well. We're best friends!" 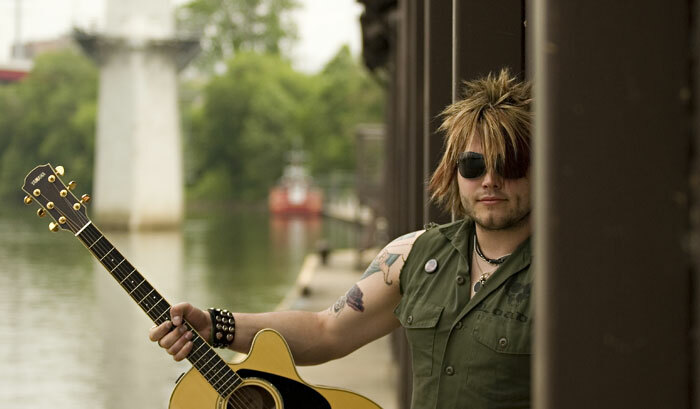 Hinder's songwriting process starts on acoustic guitar. "We figure, if it doesn't sound good stripped down with one voice and acoustic, there's no sense bringing it to the entire band," says Garvey. And the acoustic of choice for both Garvey and co-guitarist Mark King is Yamaha's handcrafted LJX6C. "Mark and I have a couple of them," Garvey notes. "We've been playing them and talking to the Yamaha guys for about a year and a half. They're a great group of people! The guitars are great, too--we love to play them. For our acoustic performances, it's all Yamaha. We use them in the regular show too, for the intro and the ending of 'Lips of an Angel' and on 'Better Than Me.' I have a jumbo-sized model, which has a big sound and is easy to play. The Yamaha's just an all-around great guitar." Garvey says he's living the life he's always dreamed of. "Growing up, I'd watch Motley Crue and Guns N' Roses on MTV, with the drinking and the chicks, and I thought, 'That's what I want to do!' We hate it when great bands break up. But I don't think we're going to be breaking up anytime soon. We're family, and we're going to stay like that. We want to be like the next Aerosmith or Rolling Stones." But as much fun as he's having, Garvey remembers those who made it all possible. "I always want to thank the fans," he says. "Without them, we wouldn't be doing what we do. Keep coming out to shows and buying the albums, and we'll see everyone at a show!"